Although it was a near-certainty that the Russian Duma would ratify the New START treaty, Russian lawmakers raised concerns that mirrored those of their U.S. counterparts. 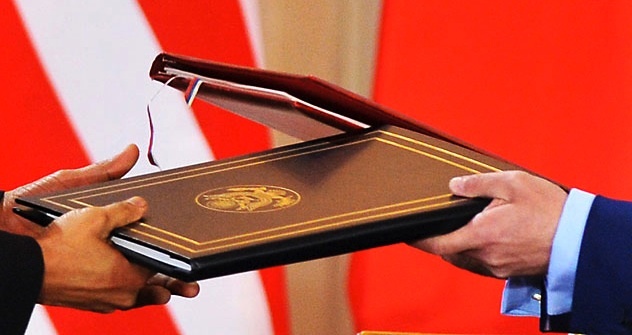 As it was always expected, the Russian parliament has ratified the New START treaty, a U.S.-Russia strategic nuclear arms reduction pact signed by Presidents Barack Obama and Dmitry Medvedev in Prague in April 2010. Still fresh in memory is the high drama that marked the New START ratification process in U.S. Senate late last year: the Obama administration’s muscular efforts to break the Republican opposition to the treaty, an intense horse trading aimed at securing 67 votes needed to approve the treaty, and the final vote in the waning hours of the lame-duck Senate session, a vote whose outcome no one, including President Obama himself, could comfortably predict until the very end. In contrast, as it progressed through the lower (the Duma) and the upper (the Federation Council) chambers of Russia’s legislative body, the ratification process lacked any elements of a show. This is not to say, however, that there was no intrigue at all. While the Federation Council approved the treaty unanimously, the vote in the Duma was 350-96 (with one abstention). Voting against the treaty were the Communists and the deputies from Vladimir Zhirinovsky’s Liberal Democratic Party. The dissenters raised essentially the same objection to New Start as their Republican colleagues in U.S. Senate: that the treaty makes too many concessions to the other side. Yet much more important was an effort by the Russian lawmakers, spearheaded by the Duma international affairs committee chairman Konstantin Kosachev, to address the language in the U.S. Senate ratification resolution. Enjoying the benefits of ratifying the treaty after their U.S. counterparts, Russian legislators decided to provide a “symmetric” response (a diplomatic equivalent of “We love you too” of sorts) to what they considered a troubled interpretation of the treaty. When discussing New START, U.S. Senators sent a clear message to President Obama that in their understanding, the treaty was in no way to restrict U.S. plans to develop missile defense (ABM) systems. In response, the Russian ratification resolution insisted that the treaty can only be fulfilled if the future U.S. ABM systems do not erode the Russian nuclear deterrent. Moreover, the resolution has made it clear that future disagreements on the issue may result in Russia’s withdrawal from the treaty. This strong language, although not completely unexpected, will certainly upset many in Washington. Why such an emphasis on missile defense? First, as any serious military expert would tell you, no functional U.S. ABM system capable of matching the capacities of Russian intercontinental ballistic missiles will be available in the next 10-15 years. This is quite some time away, especially given that initially, New START will only be in effect for 10 years. Second, as Russian Defense Minister Anatoly Serdyukov told the Federation Council during the ratification hearings, Russia was working on developing an ABM system of its own. Serdyukov gave no specifics, but in an earlier statement, Gen. Nikolai Makarov, the Chief of Staff of Russia’s armed forces, promised that by 2020, Russia will have an ABM system impenetrable to any kind of missile attack. Does it mean that Russia wants to restrict the U.S. missile defense without imposing any restrictions on its own ABM systems? It thus appears almost certain that when Russian Foreign Minister Sergei Lavrov and U.S. Secretary of State Hillary R. Clinton meet to exchange ratification protocols, Clinton will ask Lavrov a number of clarifying questions. In its ratification resolution, U.S. Senate also instructed President Obama to initiate, within a year, U.S.-Russia talks on cutting arsenals of shorter-range (so-called tactical) nuclear weapons where Russia has a substantial numeric advantage. The Russian parliament’s resolution did not address this topic directly, but Lavrov strongly indicated that Russia was in no rush to begin such negotiations. Without saying “no” explicitly, Lavrov first suggested that any new steps in nuclear arms reduction were premature until the New Start has been fulfilled. He further hardened Russia’s position by insisting that the issue of tactical nuclear weapons can only be discussed in coordination with other related arms control issues, such as the size of conventional arms forces in Europe, U.S. plans to develop strategic missile equipped with conventional explosives, and “weaponization” of space. Besides, in Lavrov’s opinion, negotiations on tactical nuclear weapons must include other nuclear powers: the UK, France, and China. Russia’s “symmetric” response to U.S. Senate ratification resolution must not, of course, be attributed to the pettiness of Russian officials. The diverging interpretation of New START objectives reflects the profound differences in how the both sides define major challenges to their national interests. Russia still considers possible nuclear strike by the U.S as the primary, if not the only, real military threat to its security. Maintaining absolute parity with the U.S. in nuclear weapons therefore remains the cornerstone of the Russian military doctrine, and anything (such as ABM systems) that could weaken Russia’s potential devastating retaliatory strike is viewed in Moscow with concern, to say the very least. From this point of view, the New START treaty is highly beneficial to Moscow as it allows Russia to lessen the burden of maintaining its strategic nuclear arsenal – especially given the difficulties Russia meets when trying to replace aging Soviet-built missiles with new generation systems. In contrast, since the end of the Cold War, the U.S. does not consider Russia’s nuclear capacity as the major threat to its security. The current thinking in Washington is that new threats that the U.S. is facing come from “rogues” actors, such as Iran and North Korea. In the minds of Washington strategists, classical nuclear deterrent does not work against these threats, and they can only be efficiently countered by developing ABM systems and designing non-nuclear strategic capabilities. From this perspective, the U.S. is less interested in the number of Russian warheads than in securing Russia’s cooperation in the areas the U.S. considers crucial to its national interests: cooperation on Afghanistan, Iran’s nuclear problem, and the situation on the Korean peninsula. In other words, if Russia is mostly interested in the military aspect of the New START treaty, the U.S. mainly stresses its political aspect. This asymmetry in the approaches must be taken into account when predicting future developments in U.S.-Russia relations. And remember, New START was supposed to be the easiest part of “reset, with really tough decisions still lying ahead. Well, one can surely agree on the latter.